As I pointed out last week, for the month of November, we're switching things up and the recipes can be posted in any order, not just one particular week. So for this week's Tuesdays with Dorie (TWD) installment, I made the recipe chosen by Britin of The Nitty Britty: All in One Holiday Bundt Cake. It really is everything you think of when it comes to the holidays. 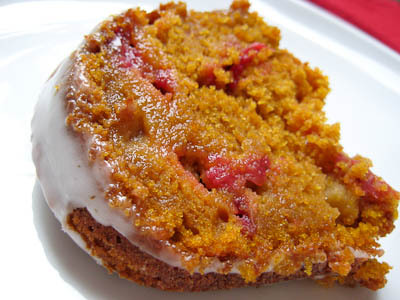 It's a spiced pumpkin cake filled with apples, cranberries, and pecans (though I omitted the pecans). Much better than any traditional fruit cake, in my opinion! Dorie says it's a one bowl recipe, but I am not sure how it can be when you have liquid and dry ingredients? It is, however, a pretty simple recipe that requires only two bowls. The most time consuming aspect of this recipe is peeling and chopping the apple and chopping up the fresh cranberries. I read that some bakers had problems getting their cake to release from the bundt pan. I had no such issues, but I did butter and flour my pan. The recipe says to just butter it but I have always buttered and floured my bundt pans so I went ahead and did that and it worked just great. This was a pretty good cake. 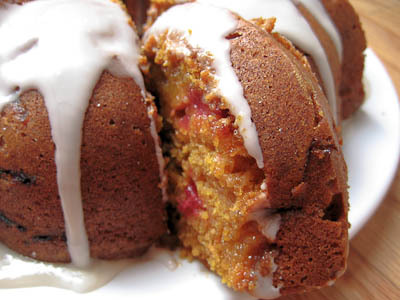 I really enjoyed the flavors of pumpkin, apples & cinnamon, and cranberries together. A lot of my apple chunks sank to the bottom of the bundt pan (top of the cake) but otherwise everything came out perfectly. 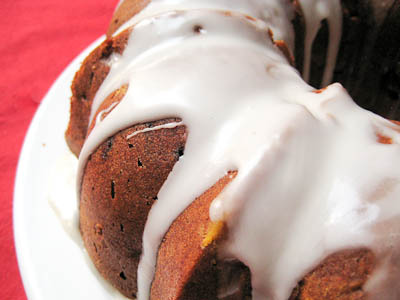 Thanks Britin, for picking this recipe - it's a great cake for the holidays. If you would like the recipe, you can find it here. Make sure you check out the TWD Blogroll, to see what everyone else baked up this week. - For easy release from your bundt pan, butter and flour it before adding the batter. PAM cooking spray with flour works well, too. - Baking time was just at 65-70 minutes in my oven. - Wrapped well, the cake will keep at room temperature for up to 5 days, at which point it will be perfect for toasting, or for up to 2 months in the freezer. Oh my goodness Jaime, your due date is tomorrow?! I hope the baby comes soon for you! I can't believe you still have the energy for baking. I'm pregnant and due in 2 weeks, and I've been slacking for the last month. You're my idol!! 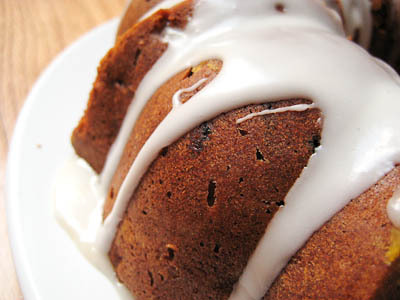 :-) Your bundt cake looks so perfect - makes me want to get baking again! This looks delicious! I had to take this week off due to being sick :( I can't wait to get back to it and make this cake! I hope your little one decides to make an appearance soon! I can't wait to see pictures! i remember seeing this last year, but i was deterred by the use of pumpkin. perhaps with enough cinnamon and apples, i could overwhelm its flavor. :) looks lovely, jaime! Jaime--your cake looks fabulous! You used the right amount of icing! I made this as well and loved it. Looks great! I think I would have left out the pecans too! I will be making this next week. Praying for a safe delivery and a healthy wee one. Looks so good and moist. I'll be checking back to find out when your babygirl decides to make her appearance! Lovely photos; the cake looks beautiful! Good luck with the baby!! Great job on the cake Jaime! It looks wonderful! I'm really looking forward to making this recipe with all of its fall flavors. your glaze looks soooo perfect and smooth! Your cake looks divine! I am making this next week and can't wait! I use the local grocery store version of Pam and don't have problems with cakes sticking. 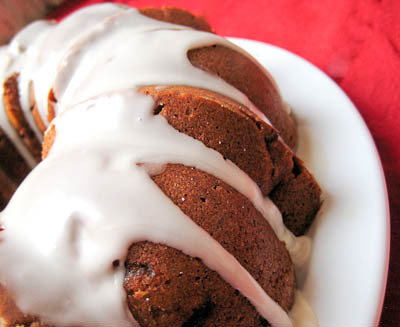 Your bundt looks gorgeous! I like the way you glazed it. Your bundt cake looks beautiful and very delicious. I made it too and loved the pumpkin flavor with the walnuts! Due dates are so frustrating! Your cake looks really delicious, though! Your cake looks great!! I posted the cake this week as well and I really enjoyed making it! Can't wait to hear about your baby!! I made this cake this week too and it came out great. The flavors go very well together and the bread is very moist and delicious. The colors look very nice, good job. Yummy and perfect for the holidays! Ooh, that looks so deliciously moist. 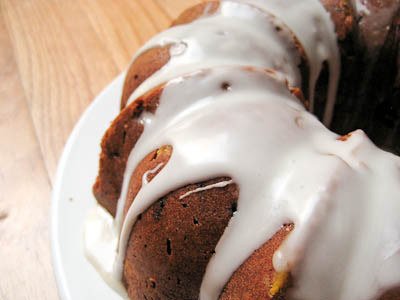 I just made a similar bundt cake with sweet potatoes and loved it. It looks really pretty with the glaze! GREAT looking cake, sure looks moist! Wow! That is one moist bundt cake! Looks delicious with the frosting dripping down the sides. I like to butter and then use a light dusting of bread crumbs. Seems to work better than flour for me. It looks magnificent, I love how moist it is! looks so good with that drippy glaze-- i'm looking forward to making this one! hope the baby makes her appearance soon!! Beautiful bundt. Love the icing dribbling down. The cake was still moist, flavorful,and sweet (at least for my taste). I didn't bother making the icing. I think the cake tastes better if it sits overnight to let the spices meld and to let the cranberries lose a little of their tartness. I've also made this recipe into muffins (approximately 18 regular-sized muffins) with good results. This recipe is a keeper. Yum! Such a gorgeous cake! The cake looks so moist and delicious! I left you an award on my blog! DEFINITELY better than traditional fruit cake - looks fabulous!